•Ingredients for 4 persons: 2 carrots, 3 onions, 2 tomatoes, 1 green pepper, some green beans and a garlic’s head. •2 pork sausages, 200grs. of cured ham, 200 grs. of bacon, one leg ham bone. 300grs Lentils. Water and olive oil. •Also you will need Chorizo picante. It’s a red spicy pork sausage, very typical in Spain. •Cut and slice the ingredients and place them inside a big pot. Reserve one onion, the bacon, the ham, one tomato, one carrot and the green pepper aside. •Cover the ingredients in the pot with cold water. 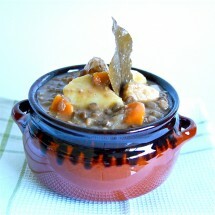 •Lentils you find in the market nowadays don’t need to be soaking in water before you cook them. Look in their package for cooking instructions. •Slice the ingredients we left aside in small pieces. •Throw the lentils in the cold water and mix with the rest of the ingredients we had in the big pot. •Use low fire and cover the pot. •Add the pepper, carrot and onion and stir for 5 minutes. •Add the tomato and stir until it looses all its water. •When lentils have been cooking at low fire for (each kind has its own timing). I cook them for 45 minutes. Ten minutes before that, add what you have cooked in the pan to the big pot. •They are ready to eat! If you perform them hours before you eat them, they will taste better. I try to do them the day before I eat them. •Perfect during cold winter days!